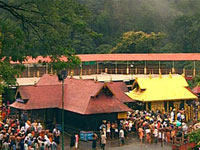 The Ayyappa temple at Sabarimala is one of the few Hindu temples in India that is open to all faiths and religious peoples. Here, the emphasis is on secularism and communal harmony. Sabarimala upholds the values of equality, fraternity and also the oneness of the human soul; all men, irrespective of class, creed or race are equal before Lord Ayyappan .Another significant aspect of the pilgrimage is that all the pilgrims whether rich or poor, learned or illiterate holding position or not master or servant are all equal before LORD AYYAPPA and all address each other as AYYAPPA Swami.Ayyappa cult gives much importance for the secularism and communal harmony and has turned out to be a model for the whole world. Legend has it that the Ayyappa temple at Sabarimala is laid out in accordance with the instructions of the Lord himself. Consequently, Malikappurathamma is on the left of the Sannidhanam, and the Lords aides, Vavar and Kadutha stand vigil at the foot of the pathinettu thrippadi the most significant 18 steps in Hinduism, leading to the sanctum sanctorum. The Sacred 18 steps : The original 18 steps at Sabarimala were granite blocks, five or six feet wide. However, they were so badly damaged by pilgrims who constantly broke coconuts on them that Travancore Devasom, the current governing body of the temple covered them with panchaloha after a lengthy Devaprashanam. The renovation work was completed in November, 1985 and now the holy steps are covered in gold. According to a popular belief, the first 5 steps signify the five indriyas or the senses (eyes, ears, nose, tongue and skin), the following 8 the ragas (tatwa, kama, krodha, moha, lobha, madha, matsraya, and ahamkara), the next 3 the gunas (satwa, rajas and thamas) followed by vidya and avidya. Climbing these would take the devotee closer to self-realisation. The act of crossing the 18 steps is so sacred that nobody can mount them without undertaking the rigorous 41 day fast and carrying the irumudi. It is also widely assumed that the pathinettu padikal symbolize the 18 puranas; others believe that they connote the 18 weapons with which Lord Ayyappan obliterated evil.One needs to have the sacred Irumudi on head while going up or down the 18 steps and while descending the steps the devotees climb down backwards facing the sanctum sanctorum. Homakundam:- A large homakundam or a sacred pit burned constantly in front of the Sannidhanam. The flames were fed by the coconuts/neithenga thrown in by pilgrims, after offering the ghee within them to Lord Ayyappan. It is held that as the coconuts burn in the sacrificial fire, the pilgrims undergo a ritualistic cleansing, both of the spirit and the body. Bhasmakkulam:- The shrine of Malikappurathama is about 100 metres away from the Sannidhanam. Bhasmakkulam is situated between these two holy spots. Pilgrims braving the arduous trip to Sabarimala take a tip in the sacred waters of this tank for spiritual purification and also in memory of Tapaswini Sabari who entered a pyre to end her mortal life. Sabarimala is named after her. Bhasmakkulam is repeatedly drained and filled with fresh water, on account of the millions who bathe in it. Kaduthaswamy and Karuppaswamy stand at the bottom of the Pathinettampadi . They are dwarapalakas, ensuring that the holy steps are not polluted by pilgrims who do not undergo the rigors of the 41-day abstinence and celibacy. Also they safeguard the pious from the dark spirits of the surrounding forests. It is held that Kadutha was a valiant warrior who helped Pandalamraja (Lord Ayyappan's foster father) beat his archenemy Udayanan. Soon afterwards, Kadutha accompanied the Raja to Sabarimala to reconstruct the Ayyappa temple and eventually grew so attached to the Lord that he spent his remaining days in the temple and the adjoining woods. Adjacent to the Pathinettupadi is the shrine of Vavurswami, who is believed to have been a close associate of Lord Ayyappan. Vavur was a Muslim and several versions of his association with Ayyappan persist. 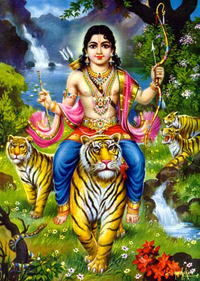 Originally a warrior, Vavur was defeated and subdued by Ayyappan; later he became of one of the closest confidants of the Lord. It is widely believed that Ayyappan himself instructed Pandalamraja to build a mosque for Vavur at Erumeli and a shrine at Sabarimala. Day 01: Arrival at Kochi (Cochin) International Airport/Ernakulam Railway Station, proceed to Sabarimala (If needed we will provide kettunira assistance also). On the way, visits to Chottanikara Temple, Kaduthuruthi temple, Vaikom Temple, Ettumanoor Temple, Erumeli Temple and finally drop at final destination, Pampa. 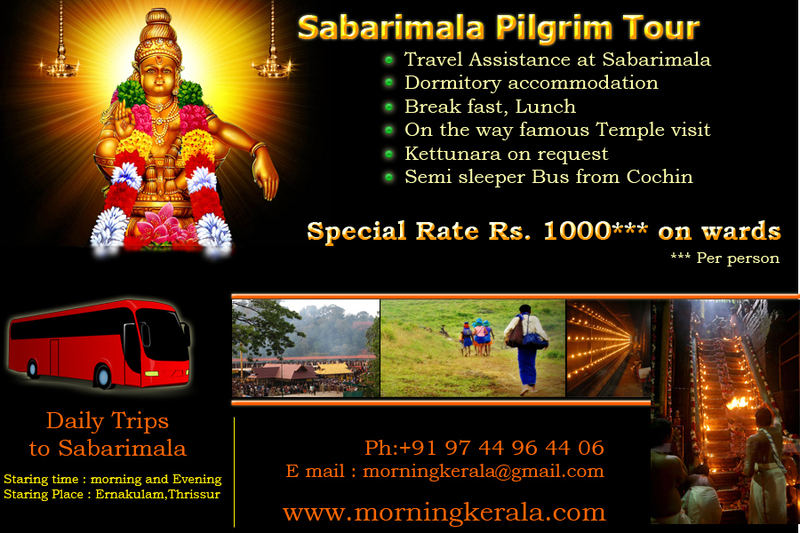 Day 02: Early morning after the Darshan you can reach Pamba and proceed to Cochin. Drop at Cochin (Kochi) Airport/ Ernakulam Railway Station. Day 01: Arrival at Kochi (Cochin) International Airport/Ernakulam Railway Station, proceed to Sabarimala (If needed, will provide kettunira assistance also). On the way, visits to Chottanikara Temple, Kaduthuruthi temple, Vaikom Temple, Ettumanoor Temple, Erumeli Temple and finally drop at final destination, Pampa. Day 02: Early morning after the Darshan you can reach Pamba and proceed to Guruvayur. Over night stay at guruvayur (will provide hotel accommodation).